I have always appreciated reality more than fantasy–actual history compared to fictional stories. There is something about hearing a true story that speaks clearly and powerfully to the heart. During this special week when the United States celebrates Thanksgiving, I want to share two true stories to enlarge your grateful heart. Both are a testament that thankfulness is often forged in the furnace of affliction. It is suffering that produces the real heart of Thanksgiving. That’s real life change producing praise and thanksgiving. Knowing the story increases the power of the music and draws you into the experience of it. Some years ago I learned the back-drop to the great hymn “It is Well With My Soul.” It moved me so greatly that I think about it (and sometimes cry) when I sing it today. Horatio Spafford (1828-1888) was a wealthy Chicago lawyer who had a thriving legal practice, a beautiful home, a wife, four daughters and a son. He was also a devoted Christian and faithful student of the Bible. His close friends included Dwight L. Moody, Ira Sankey and various other well-known Christians of the day. In 1873, Spafford scheduled a boat trip to Europe to give his wife and daughters a much needed vacation and time to recover from the tragedy. He also wanted to join D, L. Moody on an evangelistic campaign in England. Spafford sent his wife and daughters ahead of him while he remained in Chicago to take care of some unexpected last minute business. Out of great loss and tragedy the real heart of thanksgiving flowed. Now let’s move on to the true origins of Thanksgiving. They didn’t come about because of good food, fun and games, and watching football in television. The real heart of Thanksgiving was also forged in the furnace of affliction. Many years ago a friend gave me a private tour of the Pilgrim library in Plymouth Massachusetts. Behind locked doors, he allowed me to hold William Bradford’s actual Bible (Bradford was the first governor of the Pilgrim colony) while telling me the history of the Plymouth Colony which, more than anything else, forged the spiritual foundations of the United States of America. We celebrate this special holiday because a hardy, godly people cried out to God during a miserable drought and He heard their prayers and provided a miracle. They were amazed. The Indians were astonished. Out of great difficulty, just like Horatio Spafford two hundred years later, they learned Who was the source of their blessings and hope–and they were deeply grateful to Him. Whatever your personal struggles, whatever your national or global concerns are, the secret to overcoming is to lift your eyes heavenward and call out and praise the only One who brings true hope. That’s the real heart of Thanksgiving. These lovely stories are two of my favorites and told, as usual, with the great skill and gifted interpretation of Ron Bohme. Thank you, Ron. Your writings are always edifying, bear the tones of truth and are a gift to the body of Christ. What a terrific post again. We so enjoy your weekly blogs and are so blessed by them. 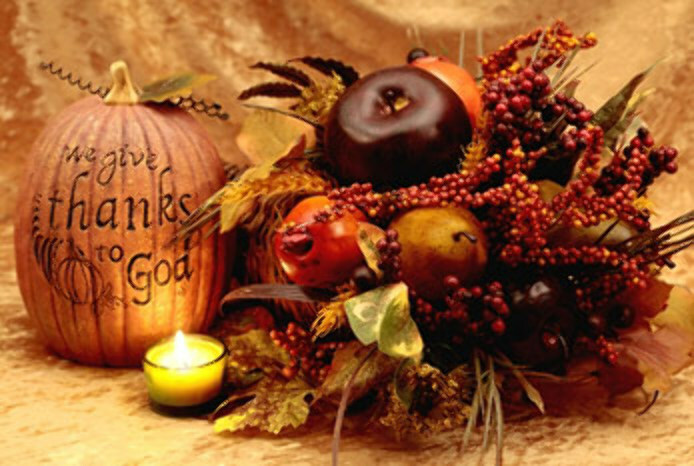 Larry and I want to wish you and your family a very safe and blessed Thanksgiving. We all have so very much to be thankful for but most of all, our wonderful Savior, Jesus.